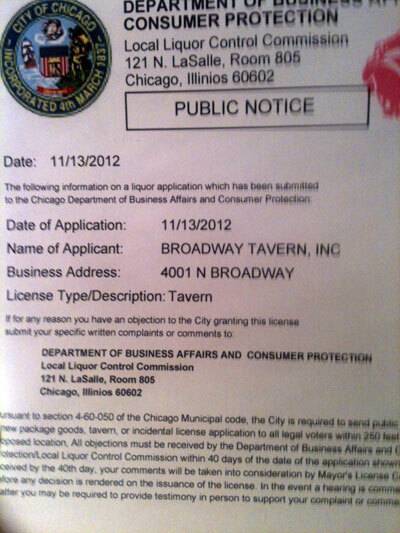 A reader sent us a notice she received in the mail about a liquor license application filed under the name "Broadway Tavern" for the storefront at Irving Park and Broadway that housed Arnold's Restaurant until it closed in September 2010. The last we heard of what might be happening in that space was in December 2011, when the owner of 2nd Story Counseling told us that: "We have been told by the landlord that some type of a bar and/or restaurant is moving into the space below our offices sometime in the early part of 2012. ... The owners of this space would be the same folks who operated the Green Dolphin." So Don and Sam Menetti, the owners of the Green Dolphin Street jazz club, as well as Lawrence House, 4526 Sheridan, and other Housing Court mainstays were going to open a bar there? When we saw the liquor license request, we looked to see who might be behind it. Nothing on the Public Notice about that. So not a Menetti, then? Wait, not so fast. A little Googling shows that the Menetti brothers are also known as the Mehmeti brothers. In fact, Burim Mehmeti is named as a defendant in the foreclosure papers filed by FirstMerit Bank against Lawrence House, Astor House, and the other properties owned by the family. 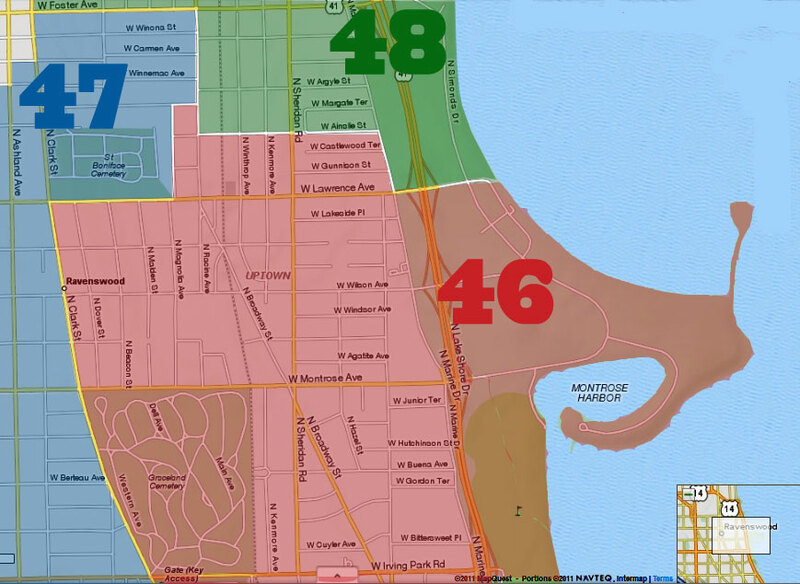 So, it's a shocker to us that the Menetti family would want to do any more business in the 46th Ward, but ... there you have it. Is Uptown ready for another Green Dolphin Street? We are dubious, and not just because of the negligence with which they have treated their residential tenants at Lawrence House and 4526 N Sheridan. Green Dolphin Street has also had a troubled history under the Menettis'/Mehmetis' ownership, including several instances of violence. We are very aware that Lawrence House's many issues, problematic to both its residents and the community, only began to be resolved when the court ordered that the Menettis turn it over to the management of a receiver. 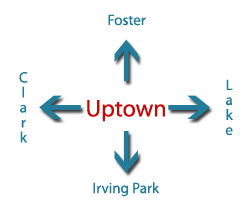 There's an extensive article in the Inside-Booster from last March that details the plans for the new club at Irving Park and Broadway, and also goes into the problems experienced under the Menettis' ownership and management of the Green Dolphin and the residential buildings. The Western European surname aliases that Chicago immigrants pick to try and "assimilate" (and you all fall for) is quite peculiar. 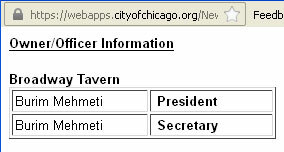 Menetti, Mehmeti....yeah, same thing. Sam or Lou seems like a fitting nickname for Biram too. Maybe the Italians ruled the joint back in the 20's but if you really want to be "progressive", stop being taken advantage of. Be more "aware". Mitt was the least of your troubles. And above poster.......I'm eating popcorn right now. This movie is very entertaining.